Samsung has showed the world that what they are capable of with their continuous innovative production of smart phones. 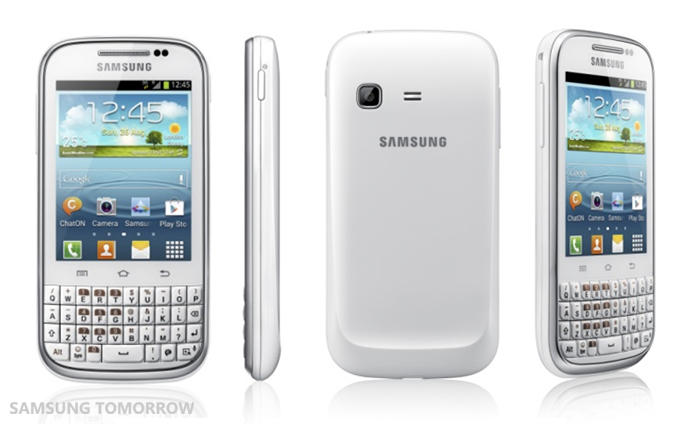 Within very short time Samsung galaxy series has gained a successful hype. Now Samsung is coming with is newest product that is “Samsung galaxy chat”. As the name suggest it will take your social networking to a higher level. Post, browse, text on Twitter, Facebook, do whatever you want to with this amazing QWERTY keypad phone. Nothing new as Samsung has already released physical keyboard in smart phones but it is the first time when Samsung has introduced ice cream sandwich (android 4.0 ) operating software with a physical keyboard. It comes with the TouchWiz user interface such as GALAXY S III. 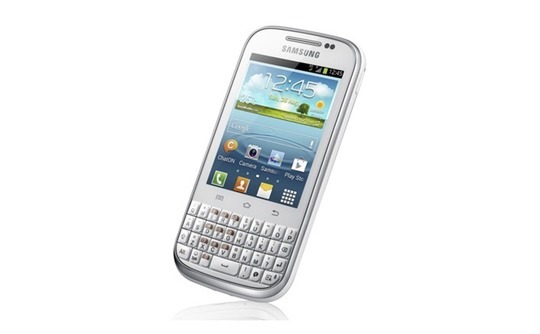 The QWERTY keyboard in this handset is of great importance for those who avoid screen touch keyboards. The interesting feature of this phone is Samsung ChatOn messanger. This handset comes with dedicated launch button for ChatOn. For full use of this app your friends should be using it also. Similar to HTC ChaCha which was having dedicated launch buttons for facebook operation, so here the dedicated buttons seems aiming at the ChatOn service only. Having an operating system of android 4.0 makes it more noticeable with presence of sensors like accelerometer, proximity and compass sensors. It has a processing speed of 850 MHz. Regarding other dimensions it has a 3 inch 250 x 320 pixels TFT capacitive touchscreen display and TouchWiz UI. Having an internal memory of 4GB which can be expandable to around 32 GB with micro SD card, this phone is a handy gadget to buy. Other connectivity features are also included like Bluetooth 3.0, USB 2.0, and Wi-Fi. The planner app present in the handset can manage to schedule quick access to Microsoft office, power point or excel.When it comes to its battery section you need not to worry because it comes with a 1200 mAh battery. It gives ample back up to the operations you need to work on with. With the above specifications and trust of Samsung, altogether it is a good phone to spent some dollars in it.